The Milwaukee Leader was a daily socialist newspaper published from December 7, 1911 to May 1942. It was one of three English-language socialist dailies in America. Victor Berger, the paper’s primary editor and inspiration, published several German language newspapers from the 1890s to 1910 and founded the Milwaukee Social Democratic Publishing Company in 1902. The Leader acted as the media voice of Milwaukee’s Social Democratic Party. The paper covered local, national, and international news, as well as sports, activities of the police, and labor. To provide up-to-date news coverage, the paper printed four editions throughout the day. The newspaper found success across the United States, selling in 300 locations across America. It reported circulation numbers of 31,874 copies each day during its first month in print. The fiscal situation of the paper was always precarious, despite raising the price of the paper to two cents in 1912. The daily stayed afloat in its early years due largely to donations from unions and other socialist newspapers, including The New York Forward and the United Brewery Workmen. Daily circulation rose to 50,000 in April 1916. Then, in October 1917, the federal government, as a result of the Leader’s strident antiwar proselytizing, rescinded the newspaper’s second-class mailing status, leading to a loss of between 14,000 to 15,650 national subscribers. In 1918, the U.S. government, under provisions of the Espionage Act, prevented the mailing of letters to the Leader. The paper survived this wartime restriction, and from 1922 to 1929 readership rose once again to between 48,200 and 49,100 subscribers. In its editorial stance, the Leader promoted socialist ideas and the candidates who carried them out. Berger, in particular, used his editorials to show how capitalism impacted ordinary people. The first issue of the Leader published stories on Wall Street’s role in the rising cost of gas and Berger’s efforts in Congress to pass a bill that would nationalize certain monopolies. Berger proudly proclaimed the Leader’s independence from the Socialist Party, which had no official ties to the publication. In in 1916 he claimed that at least 75 percent of the Leader’s readership came from outside of the Party. The Leader advocated the slow transition from capitalism to socialism and opposed violent revolution. Berger died suddenly on August 7, 1929, but he had already recognized that his age and the lingering $130,000 debt of the Leader jeopardized its future. He told the Milwaukee Social Democrats that if they did not agree to take control of the paper, he would sell it. Following his death, Publishers Incorporated took over the Leader. By 1930, circulation fell to 38,300 and the paper remained deeply in debt. 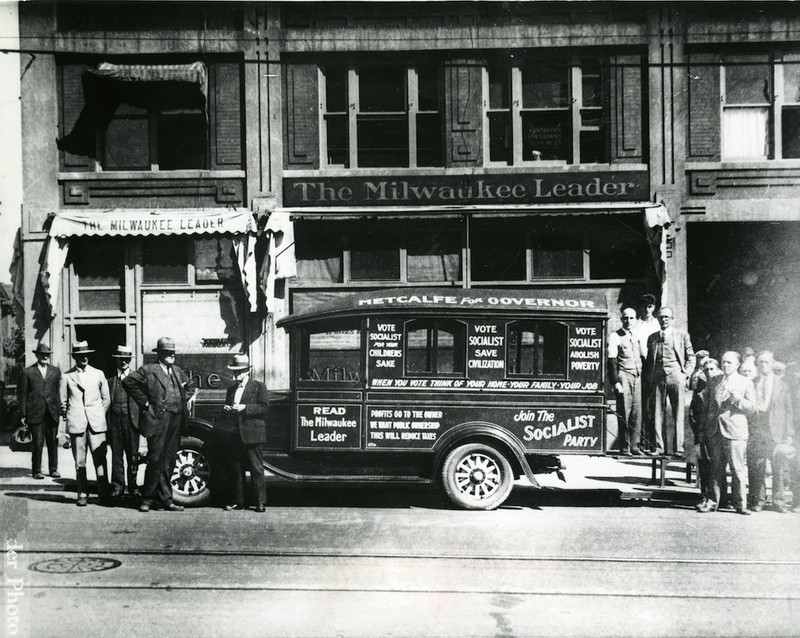 On April 20, 1938, three former employees of the Milwaukee Sentinel purchased the paper, eventually changing the name to the New Milwaukee Leader. Circulation totaled only 21,200 in 1940, leading to the publication’s demise two years later as the Milwaukee Evening Post. ^ Nichali Michael Ciaccio, “Because It Had to Be: The Milwaukee Leader, Socialism, and the First World War” (BA Senior Honors thesis, University of Wisconsin-Milwaukee, 2005), 3. ^ Michael E. Stevens, ed., The Family Letters of Victor and Meta Berger, 1894-1929 (Madison, WI: State Historical Society of Wisconsin Press, 1995), 2-3, 3n5 8, 21, 66n2; Marvin Wachman, History of the Social-Democratic Party of Milwaukee, 1897-1910 (Urbana: The University of Illinois Press, 1945), 33. ^ David V. Hingtgen, “Victor L. Berger and The Milwaukee Leader” (Master’s thesis, Marquette University, 1962), 31-34; Elmer A. Beck, Autopsy of a Labor Daily: The Milwaukee Leader, (Lexington, KY: Association for Education in Journalism, 1970), 3-4. ^ Beck, Autopsy of a Labor Daily, 4-9; Hingtgen, “Victor L. Berger and The Milwaukee Leader,” 67, 80, 98-99, 130. ^ Hingtgen, “Victor L. Berger and The Milwaukee Leader,” 36-40, 55-58. ^ Beck, Autopsy of a Labor Daily, 15-20. ^ Hingtgen, “Victor L. Berger and The Milwaukee Leader,” 142-144. Beck, Elmer A. Autopsy of a Labor Daily: The Milwaukee Leader. Lexington, KY: Association for Education in Journalism, 1970. Ciaccio, Nichali Michael. “Because It Had to Be: The Milwaukee Leader, Socialism, and the First World War.” BA Senior Honors thesis, University of Wisconsin-Milwaukee, 2005. Hingtgen, David V. “Victor L. Berger and The Milwaukee Leader.” Master’s thesis, Marquette University, 1962. The Milwaukee Leader. Microfilm. The Milwaukee Public Library. Stevens, Michael E., ed. The Family Letters of Victor and Meta Berger, 1894-1929. Madison, WI: State Historical Society of Wisconsin, 1995. Wachman, Marvin. History of The Social-Democratic Party of Milwaukee, 1897-1910. Urbana, IL: The University of Illinois Press, 1945.